While some of these redeals might be free on a given hand, most often there will be a small additional fee to activate the redeal. These fees will be clearly displayed before you finalize the redeal action. Some other interesting twists that European Blackjack Redeal Gold presents include the chance to play blackjack online with just 2 decks. With fewer cards in play, you have a better chance of guessing which cards may come up, making the redeal option even more useful. 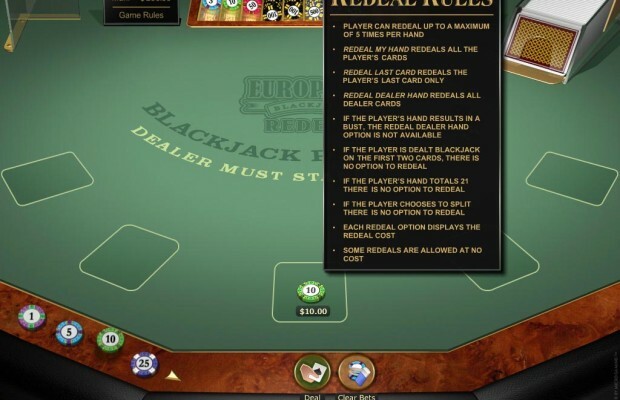 European Blackjack Redeal Gold has other significant differences from other blackjack games. For example, insurance is not offered on a dealer’s ace, and split and double down options are limited. You can only split once, and you can’t double down on a split or split unlike cards. Once you master these quirks of European Blackjack Redeal Gold, you’ll soon get absorbed into the world of the game. Seamless card and chip tray animations, elegant and realistic graphics, and subtle ambient sound will draw you in and make you feel like you’re right there at the casino table. You might even find yourself trying to order a drink as if you were really in a casino. ← Previous Story Strategies to win Online Blackjack!